Prior to accepting God’s greatest gift, the gift of His Son, the bible tells us that we all, “formerly walked according to the course of this world, according to the prince of the power of the air, of the spirit that is now working in the sons of disobedience.” (Ephesians 2:2). We were citizens of the domain of darkness destined to eternal hell and separation from God. We were bound in our sins with no hope of escape and no hope of freedom from condemnation-until God sent His Son. 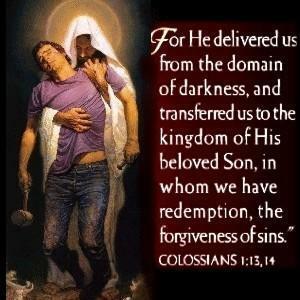 Colossians 1:13 tells us He, Jesus, rescued us. The word “rescued” is used in past tense indicating that the rescue has already taken place. Jesus has rescued us out of the domain of darkness and brought us into the kingdom of God. How did we become citizens of the darkness in the first place? Sin. Romans 6:23 tells us that the wages of sin is death. We bought our residency into the domain of darkness and our ticket to hell with our own sins. The bible tells us that “all have sinned and fallen short of the glory of God.” (Romans 3:23). Therefore, everyone who has ever lived has resided in or is residing in the domain of darkness. They have either been saved from the domain of darkness, by Jesus, or stand in need of salvation. The gift we have received from God is the gift of redemption. Redemption that came at a great price to Jesus but is a free gift to those who believe. The gift of redemption that was paid for by the blood of Jesus but freely offered to whoever will repent of their sins and make Jesus Lord of their lives. In faith, we ask Jesus to forgive us of our sin knowing that they have already been paid for. Truly Jesus is the greatest gift, “Who gave Himself for us to redeem us from every lawless deed, and to purify for Himself a people for His own possession.” (Titus 2:14). This is part 5 of 28 devotions that will go through Christmas Eve. If you would like to subscribe to my daily devotions please PM me your email. Also, please share.